What is Heartburn and Indigestion? Racked with pain after eating spicy foods? Struggling to sleep because of that burning feeling? Most people will experience heartburn or indigestion at some point in their lives. Trusted for over 30 years, Zantac 75 is an effective treatment for relieving heartburn and indigestion associated with the consumption of food and drink.1 Containing the active ingredient ranitidine hydrochloride, Zantac 75 eases heartburn and indigestion symptoms for up to 12 hours. 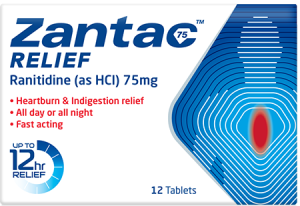 Zantac 75 contains ranitidine. For the symptomatic relief of heartburn, indigestion, acid indigestion and hyperacidity and for the prevention of acid indigestion, indigestion, hyperacidity and heartburn associated with consuming food and drink. Always read the leaflet. Zantac 75 Relief contains ranitidine. For the symptomatic relief of heartburn, indigestion, acid indigestion and hyperacidity. Always read the leaflet.